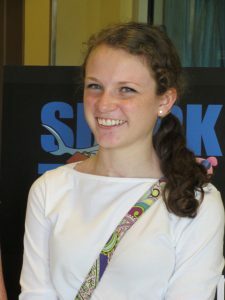 Edgefield County student Virginia Brooks Bledsoe was among fifty-three rising high school juniors and seniors met in Newberry recently to gain valuable leadership skills and a better understanding of SC agriculture at the South Carolina Farm Bureau Federation’s 2015 Youth Leadership Conference. Edgefield County student Virginia Brooks Bledsoe was among fifty-three high school rising high school juniors and seniors from across South Carolina who recently participated in the South Carolina Farm Bureau Federation’s (SCFB) 2015 Youth Leadership Conference in Newberry, SC. The conference, held on the Campus of Newberry College June 14-17, allowed students to gain valuable leadership skills, a better understanding of SC agriculture, and of Clemson University, one of the state’s land grant universities. In addition to emphasizing the understanding of agriculture, the conference also featured a number of workshops focused on leadership and teamwork. The conference operates on a two-year curriculum cycle where students learn about agricultural marketing and promotion one year and about government relations and agricultural advocacy the next. This year’s conference focused on marketing commodities in South Carolina. Students were addressed by industry professionals on leadership, team building and goal setting. Kirby Player, director of college relations for Clemson University’s College of Agriculture, Forestry and Life Sciences, introduced the conference by energizing the students and showing them what the agriculture industry has to offer for students. Director of organizational training and leadership development for SCFB, Jessica Cabrera, engaged participants in leadership activities essential for students to develop personally and professionally. This year’s winning team was the turkeys. Judges said their presentation was well thought out and put together and very deserving of the winning title. The team members were Jacob Taylor of Lexington County, Claire Manuel of Allendale County, Emily Burris of Anderson County, Hannah Hansen of Beaufort County, Harrison Tucker of Cherokee County, Julia Smoak of Dorchester County, Briley Lawrimore of Georgetown County, Luke Newton of Greenwood County, Reid Phipps of Horry County, James Hilton of Lexington County, and Mac Werts of Newberry County. The team’s two-fold plan was to clean turkey houses and haul off the waste for a fee. They would then turn the litter into fertilizer and sell it for a profit. The conference closed with the announcement of next year’s Youth Leadership Team Leaders. They will be John Eaddy of Florence County, Carlie Taylor of Allendale County, and Megan Garris and Jacob Reeves of Dorchester County. The SC Farm Bureau Federation is a non-profit membership organization formed to promote and preserve the work of family farmers and rural lifestyles across the state. In exchange for their annual dues and financial support of education, promotion and lobbying efforts on behalf of agriculture and family farmers, Farm Bureau members are entitled to discounts and access to a number of quality products.